Free Test Kit for Your Pool!! 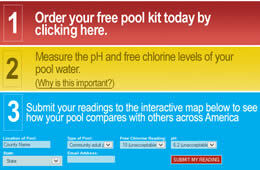 Healthy Pools is giving away a FREE test kit for your pool! Then you can even inter your pH and chlorine levels of your pool to an interactive map on their site to see how your pool compares to others across America.